Bike Star is a specialist German child bike's company that produces a wide range of children’s vehicles including scooters and skateboards. Bike Star balance bikes are suitable for children from as young as 18 months all the way through to 5 year olds. Bike Star are well known for ergonomically friendly bikes for young children as well as sporty styles for those that are accomplished riders. This guide will review the Bike Star range in some detail, so to get started on this leading brand we have produced this easy to use table which show each model, the suitable age, the size of the bike and distinguishing features. 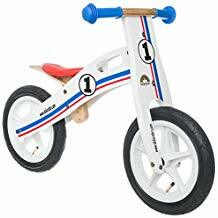 The signature model of the Bike Star range is the Bike Star Classic Balance bike. 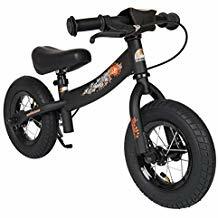 This is a high quality metal balance bike, and of the key features is the low platform or footboard which makes it ideal for balance bike beginners. The footboard allows the child to rest their feet as they scoot along, so they easily put their feet on the floor as they ride until they learn how to balance. This is very similar feature to the PUKY LRM Learner bike. This bike scores well on appearance, with a high quality metallic paint finish and it is available in either Blue, Green, Heartbeat Red or Pink and White. It is well made with strong welds so will be able to withstand being ridden, manhandled and dumped on the floor by a small child. One of the most important aspects of choosing the best balance bike for your child is the saddle height, and the saddle on this bike starts at just 30cm which makes it ideal for children aged 2 or above. 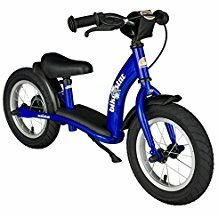 This height compares well with other recommended balance bikes for 2 year olds, and it can easily be adjusted as your child grows so this should see them all the way through to a pedal bike! The Bike Star Classic Balance Bike also comes equipped with a child friendly handbrake and a stand, extra features which really add value to the bike. This bike is available with either 10 inch or 12 inch tyres, and speaking of the tyres these are pneumatic air tyres which provide a smooth ride on all surfaces. The 12 inch model is larger and slightly heavier so this would be a better choice for an older child of 3 or above. The Bike Star Classic Balance Bike is a great, mid-range balance bike and is available for between £70 and £75. The Bike Star Sport Balance Bike offers something completely different to the Classic bike, with a sporty style and exciting designs on the frame and wheel forks. The low footboard has also been removed, giving the child more room to move their legs during the ride and giving the bike a sportier appearance. Features include air tyres, alloy wheels, an adjustable handlebar and an adjustable saddle height that starts at just 30cm and can be raised as your child grows. The Bike Star Sport Balance bike is available in several striking designs including Brilliant Green, Flamingo Pink and Berry & Turquoise. 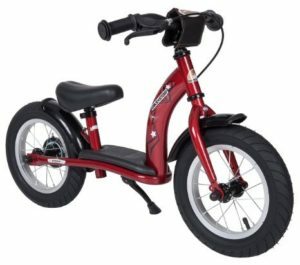 Similarly to the Classic model, the Sport is available with either 10 inch or 12 inch tyres, with the larger bike being more suitable for children aged 3 or above. Priced at between £65 - £70, this is another great option for a high quality, mid-range balance bike. 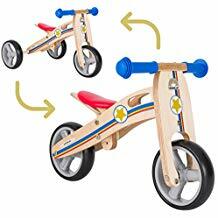 Bike Star now also offer a wooden balance bike as part of their range, so if you prefer the benefits of a wooden bike this may be the bike for you. The frame is made from environmentally friendly beech wood, which makes it much lighter than the metal Classic and Sport models and therefore easier for a young child to handle. The bike has designed with a great eye for detail, and is available in a number of different painted colours and designs that will appeal to young children. Features include an extra-large handle which makes the bike easy to transport, as well as rubber handlebar grips for protection from falls. As with most other wooden balance bikes, the saddle is not as adjustable as on the wooden bikes with a limited number of settings. 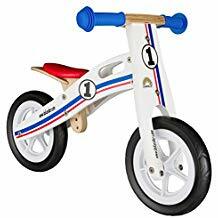 We would recommend the 10 inch version of this bike for 2 year olds and the 12 inch version for 3 years and above. The final feature of the Bike Star Wooden Balance Bike is the EVA foam tyres, which are easy to maintain and puncture proof. This bike is available from £45, depending on the size of bike that you purchase and is a great choice if you prefer a wooden balance bike. The final balance bike in the Bike Star range is the extremely clever convertible mini 2 in 1 Bike and Tricycle. 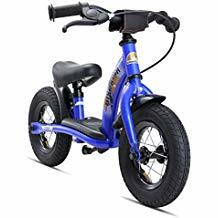 This bike is suitable for children as young as 18 months, as they can start off riding the tricycle with 3 wheels which can then convert to a small balance bike as they gain more confidence! It is made from a lightweight and high quality wooden frame, painted in bright colours which will appeal to very young children. This really is one of the smallest balance bikes available, with a seat height starting at just 26cm (there is another option of 28cm). 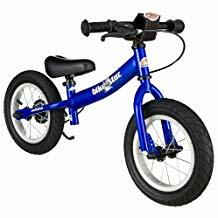 If your child is already 2 or about to turn 2 then we would recommend the 10 inch Bike Star Classic or Sport or one of our other recommended balance bikes for 2 year olds. This bike is available as a ‘Little Sheriff’ or ‘Little Princess’ and is one of the best balance bike models available for 18 month olds. It is priced at around £55.